The play is touring again in December and early in 2019. If You've Only Seen I'm Frank Morgan before 2018, you haven't seen I'm Frank Morgan! 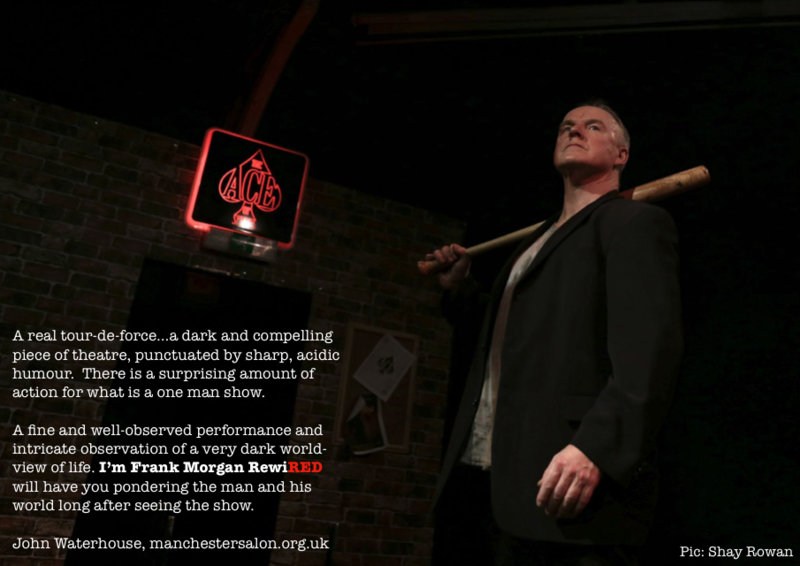 That's one of the reasons the play is retitled - I'm Frank Morgan: RewiRED - those of you that have seen this new version will know why those three last letters are in RED. There is a wealth of new material here, this is a whole new animal, in every sense of the word. How did this happen? I got to thinking. I wondered how Frank would view all that. And then I realised how much he would manipulate it, turn it, use it as a tool to further build his empire. Frank would thrive today. ​Then I got to re-writing. Within 3 days I had ripped apart the old script, taking out passages that fitted at the time it was written, and bringing in so much new material, new story threads - a whole extra 50 minutes of material meaning that there would now be a cliff hanger and interval to take us into a second act, a two act one man show - I must be f*cking nuts - and now all set inside Frank's club, The Ace of Spades. The Death Card. The man himself. So I rolled with it, and the themes of the original started to shift. There was more than a touch of neo-gothic horror to it now, a modern twisted fairy tale feel - but still very relevant to the world today. It was a huge gamble. There will be many of you that saw the production years ago that will think you've seen it. Believe me, you haven't - this is something fresh, new, stark and pretty much unforgettable. The best Frank Morgan I have ever done. Audiences and critics have been really effected by it. All have given incredibly positive reviews. The best thing I did with this story was to revisit it. The show has been blessed with some magnificent photography from Karen McBride and Shay Rowan, some of which is here - beautiful works of art, and there's a haunting sound design by Justin Wetherill. Once again Darren McGinn has worked created posters and digital art that really captures the world so vividly. Art is all about collaboration, I'm lucky to have very talented co-conspirators. The play I'M FRANK MORGAN was first introduced to the world as a short film, produced in 1999, details on the film are elsewhere on this site. Up to 2018 the play, 50 minutes long, had only had three very short runs, each run of the play being a radical re-interpretation. 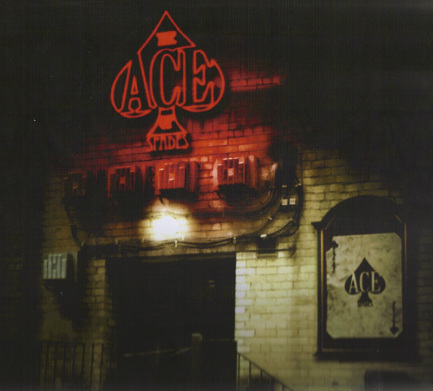 Premiering at the MANCHESTER 24/7 THEATRE FESTIVAL in 2005, directed by JO CARLON with Frank as a straight on suited and booted, gangster, with a machine gun mouth ripping into the audience. 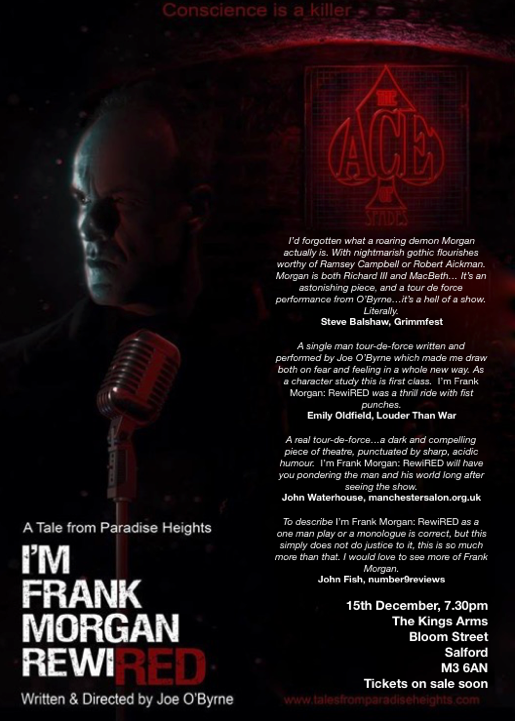 The production returned to The Lowry in 2009 under IAN CURLEY's direction, this time as a multi media production, two screens on stage and Frank interacting with them, that machine gun mouth still firing off with precise and chilling aim. 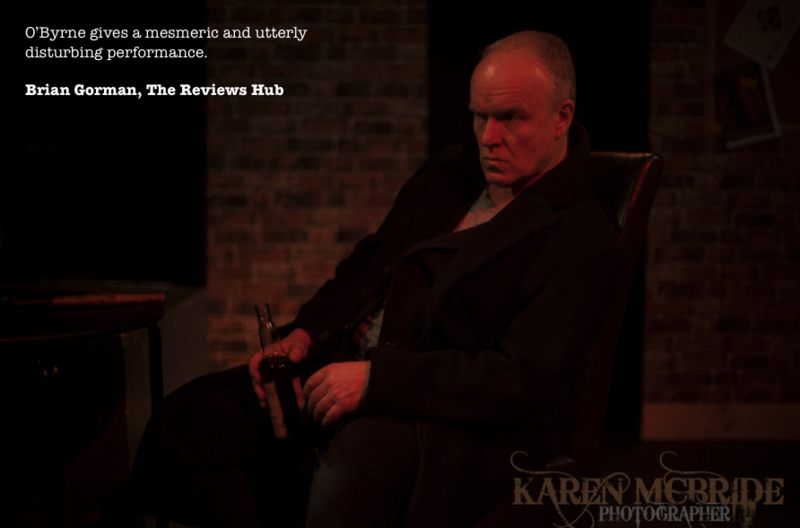 The last interpretation premiered in September 2012 at Bolton's Octagon Theatre, getting great reviews and moving onto The John Cooper Clark Studio, The Black Lion, Salford in November 2012. 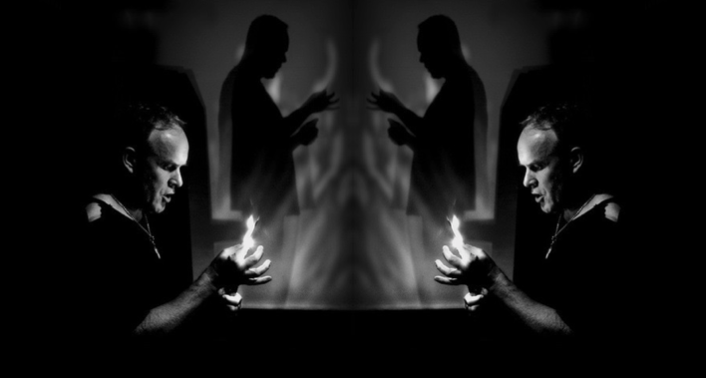 This IAN CURLEY directed interpretation being a much more psychological mind trip through the fractured mind of a sociopath - gone was the suited booted character, replaced by someone much more akin to Jeff Goldblum's Seth Brundle in THE FLY, a man clearly going insane - the same script each time, showing how flexible approaches can be to the text. And so to 2018 and a bold new version. 2018; A Time to be Frank. A Time for Frank to be...and this time being the ultimate in one man shows...this time to be written, directed and performed by myself. I like a challenge. Frank Morgan was a background character in a novel I was attempting to write back in 1998 - the novel - PARADISE HEIGHTS - remains half finished. But Frank seemed to walk off the page and out into life. He had two short paragraphs of dialogue in the book, the starting point. I was still a student at Salford University and was looking for a piece to do for my 20th Century Theatre class, I had to find a monologue to perform to be marked on. I asked my tutor, Mark Bishop, if I could write something myself rather than use existing texts, texts that he'd probably seen a million times. He gave me the weekend to come up with something. Up to this point I had never written anything, but I felt the urge to write - so strong, I had to get something written, even if it was only ten minutes of a scrappy little monologue. So I'm driving home, happy with myself that mark was letting me write something. Then the panic set in - what the hell was I going to write? I was just about giving up when I came across those two paragraphs from Frank on my computer. I thought, yes - I can stretch that to 10 minutes, so I started on it...and couldn't stop. I had a full one act, sixty minute play by the end of the night, the first - and fastest - thing I ever wrote. It would become the cornerstone of TALES FROM PARADISE HEIGHTS. Frank would also return in THE BENCH (elsewhere on this site and and with a Masterful performance from IAN CURLEY in the role) in an unforgettable twenty minutes of theatre for audiences that have seen that production. He returned again in the film THE WATCHER, and in the first animated Tale from Paradise Heights - THE NIGHT DEATH PUT ME DOWN. The plays RANK, STRAWBERRY JACK and DIANE'S DELI all feature references to Frank, and even though he doesn't appear in these three tales, his influence is strong and was been felt and commented upon by audiences enjoying these productions. 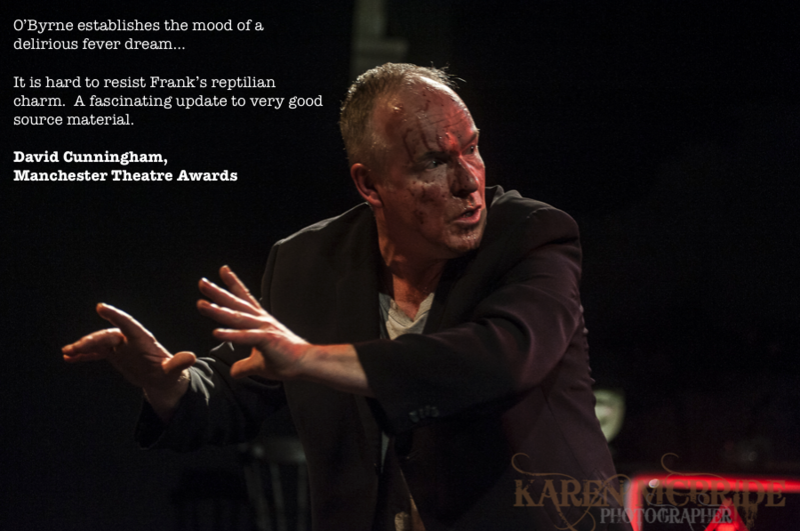 Frank casts a very long shadow over The Heights, he's the villain audiences love and hate. O'Byrne plays Frank as an avuncular softly spoken man and his technique has real impact when the shark loses his temper in a shocking burst of violence. 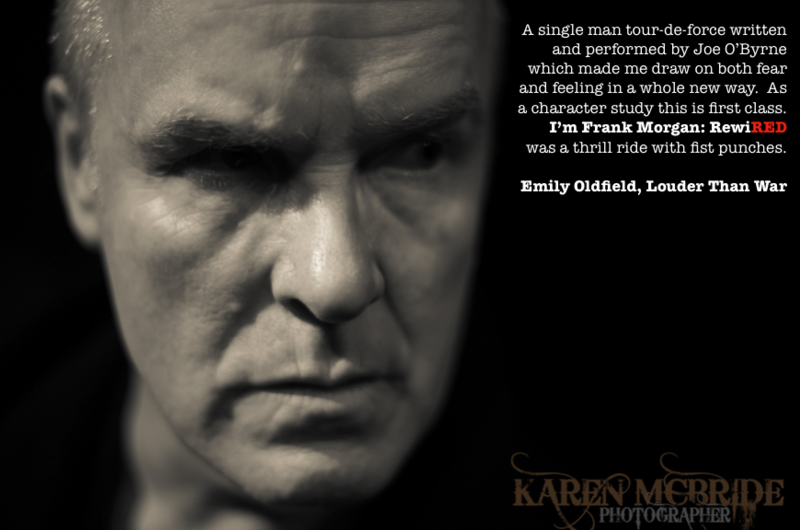 An unrepentant and self aware villain in the style of Richard III, there is no doubt the play has retained it's power.